Exchange Server 2013 is the current version of Microsoft’s email and collaboration suite. It is a successor to Microsoft® Exchange Server 2010. Exchange Server 2013 offers many enhancements in architecture, functionality, and features for both administrators and end users. To successfully implement Exchange Server 2013, you should know its prerequisites, as well as how to deploy it in your existing infrastructure. This post examines how to deploy and manage Exchange Server 2013. To ensure proper placement of Active Directory components in relation to computers that are running Exchange Server, you must understand how Exchange Server 2013 communicates with AD DS and uses Active Directory information to function. AD DS stores most Exchange Server 2013 configuration information. 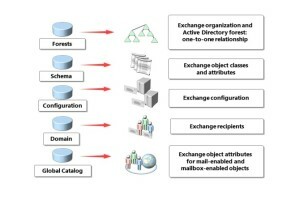 An Exchange Server organization and an Active Directory forest have a one-to-one relationship. You cannot have an Exchange Server organization that spans multiple Active Directory forests. You also cannot have multiple Exchange Server organizations within a single Active Directory forest. The Exchange Server 2013 installation process modifies the schema partition to enable the creation of Exchange Server-specific objects. The installation process also adds Exchange Server-specific attributes to existing objects. For example, the installation process updates user objects with additional attributes to describe storage quotas and mailbox features. The configuration partition stores configuration information for the Exchange Server 2013 organization. Because AD DS replicates the configuration partition among all domain controllers in the forest, configuration of the Exchange Server 2013 organization replicates throughout the forest. The configuration partition includes Exchange Server configuration objects, such as global settings, email address policies, transport rules, and address lists. The domain partition holds information about recipient objects. This includes mailbox-enabled users, and mail-enabled users, groups, and contacts. Objects that are mailbox-enabled or mail-enabled have preconfigured attributes, such as email addresses. • When you install Exchange Server 2013, the email attributes for mail-enabled and mailbox-enabled objects replicate to the global catalog. In the context of Exchange Server, global catalog is used for the following: The global address list (GAL) is generated from the recipients list in an Active Directory forest’s global catalog. • Exchange Server 2013 transport service access the global catalog to find the location of a recipient mailbox when delivering messages. • Client Access servers access the global catalog server to locate the user Mailbox server and to display the global address list to Microsoft Office Outlook®, Microsoft® Outlook Web App, or Exchange ActiveSync clients. performance. Exchange Server 2013 does not use Read-Only Domain Controllers(RODCs) or RODCs that you configure as global catalog servers (ROGC). This means that you should not deploy an Exchange 2013 server in any site that contains only RODCs or ROGCs. Exchange Server. Exchange Server services use DNS to locate a valid domain controller or global catalog. By default, each time a domain controller starts the Netlogon service, it updates Domain Name System(DNS) with service (SRV) records that describe the server as a domain controller and global catalog server, if applicable. To ensure that the domain controller updates DNS records properly, it is essential that all domain controllers use an internal DNS server that supports dynamic updates. 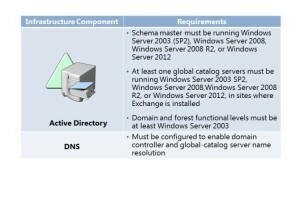 After DNS records are registered, computers that are running Exchange Server can use DNS to find domain controllers and global catalog servers. SRV resource records are DNS records that identify servers that provide specific services on the network. For example, an SRV resource record can contain information to help clients locate a domain controller in a specific domain or site. All SRV resource records use a standard format, which consists of several fields that contain information that AD DS uses to map a service back to the computer that provides the service. The SRV records for domain controllers and global catalog servers are registered with different variations to allow locating domain controllers and global catalog servers in several different ways. One option is to register DNS records by site name, which enables computers that are running Exchange Server to find domain controllers and global catalog servers in the local Active Directory site. Exchange Server always performs DNS resource queries for the local Active Directory site first. When a computer that is running Exchange Server is a member server, Exchange Server configures it dynamically with its site each time it authenticates to AD DS. As part of the authentication process, the registry stores the site name. When the Exchange Server queries DNS for domain controller or global catalog server records, the Exchange Server always attempts to connect to domain controllers that have the same site attribute as the Exchange Server. Host records provide host name to IP address mapping. Host records are required for each domain controller and other hosts that need to be accessible to Exchange Servers or client computers. Host records can use Internet Protocol version 4 (IPv4), which are A records; or Internet Protocol version 6 (IPv6) records, which are AAAA records. A Mail Exchanger (MX) record is a resource record that allows servers to locate other servers to deliver Internet email by using the Simple Mail Transfer Protocol (SMTP). An MX record identifies the SMTP server that will accept inbound messages for a specific DNS domain. Each MX record contains a host name and a preference value. When you deploy multiple SMTP servers that are accessible from the Internet, you can assign equal preference values to each MX record to enable load balancing between the SMTP servers. You also can specify a lower preference value for one of the MX records. All messages are routed through the SMTP server that has the lower preference value MX record, unless that server is not available. organizations use reverse lookups as an option for spam filtering, so you should consider adding reverse lookup records for all SMTP servers that send your organization’s email. 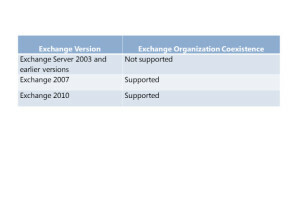 Note: Server Core installation option is not a supported operating system option for Exchange Server 2013 installation. In addition, Windows Server 2008 R2 Standard does not support failover clustering and cannot use database availability groups (DAGs) in Exchange Server for high availability. You cannot upgrade Windows Server after you have installed Exchange.Depending on which Exchange Server role is installed, different Windows components can be installed on a server. However, you do not need to install these roles and features prior to Exchange Server installation because the installation process can install the necessary roles and features automatically. • Microsoft .NET Framework 4.5 (only for Windows Server 2008 and 2008 R2). • Windows Management Framework 3.0 (already included with Windows Server 2012). • Remote Server Administration Tools (RSAT) for AD DS (can be installed with Server Manager). • Microsoft Unified Communications Managed API 4.0, Core Runtime 64-bit. • Microsoft Office 2010 Filter Pack SP1 64-bit or Microsoft Office 2013 Filter Pack. • Exchange Server Updates for Knowledge Base articles KB974405, KB2619234, and KB2533623 when installing Exchange Server 2013 on Windows Server 2008 R2. You also should ensure that the Task Scheduler service is enabled and running on the server where you plan to install Exchange Server 2013.
organization meets AD DS and DNS requirements. Pack 2 (SP2). By default, the schema master runs on the first Windows domain controller installed in a forest. • In each of the sites where you deploy Exchange Server 2013, at least one global catalog server must be installed and must run Windows Server 2012, Windows Server 2008, Windows Server 2008 R2, or Windows Server 2003 SP2. • In each site where you plan to install Exchange Server 2013, you must have at least one writable domain controller running Windows Server 2012, Windows Server 2008, or Windows Server 2008 R2. • The Active Directory domain and forest functional levels must run Windows Server 2003, at the minimum, or newer versions. 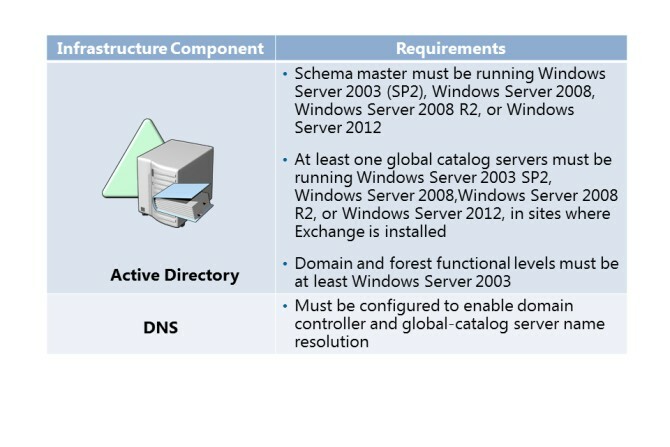 Before you install Exchange Server 2013, you must configure DNS correctly in your Active Directory forest. All servers that run Exchange Server 2013 must be able to locate Active Directory domain controllers, global catalog servers, and other Exchange Servers. Before implementing Exchange Server 2013 in your environment, you must prepare AD DS. groups and special permissions in AD DS; these are also configured during AD DS preparation. You can prepare your AD DS by running the Exchange Sever 2013 Setup Wizard with a user account that has the permissions required to prepare Active Directory and the domain. To prepare the AD DS schema and configuration partition, you must use an account that is a member of the Schema Admins and Enterprise Admins groups. By using this type of account, the wizard automatically prepares Active Directory and the domain. setup /PrepareSchema or setup /ps. To execute this command, you must also be a member in the Enterprise Admins or Schema Admins groups. • Connect the Exchange Server to the schema master domain controller. • Import LDAP Data Interchange Format (LDIF) files to update the schema with Exchange Server 2013 specific attributes. • Set the schema version (ms-Exch-Schema-Version-Pt) to 15132. • Verifies that the schema has been updated, and that the organization is up to date, by checking the objectVersion property in Active Directory. The objectVersion property is in the CN=<your organization>,CN=Microsoft Exchange,CN=Services,CN=Configuration,DC=<domain> container. The objectVersion value for Exchange Server 2013 is 15448. • Assigns specific permissions throughout the configuration partition. • Creates the Microsoft Exchange Security Groups OU in the root domain of the forest, and assigns specific permissions to this OU. • Creates the management role groups within the Microsoft Exchange Security Groups OU. • Creates the Unified Messaging Voice Originator contact in the Microsoft Exchange System Objects container of the root domain. • Prepares the local domain for Exchange Server 2013. To perform this command, you must be a member of Enterprise Admins security group, and you must run this command on the computer that is in the same domain as the schema master domain controller. If you have more than one domain, you should wait for a period of time after running this command, so that changes performed to AD DS are replicated to all other domains and domain controllers.At the end of this process, you should execute the setup /PrepareDomain command in each domain where Exchange recipients will be located. You do not need to run this command in a domain where you ran setup /PrepareAD. Alternatively, you can also run setup /PrepareDomain:<FQDN of domain you want to prepare> to prepare a specific domain, or you can run setup /PrepareAllDomains or setup /pad to prepare all domains in your organization. • Creates the Microsoft Exchange System Objects container in the root domain partition in AD DS, and sets permissions on this container for the Exchange Servers, Exchange Organization Administrators, and Authenticated Users groups. • Sets the objectVersion property in the Microsoft Exchange System Objects container under DC=<root domain>. This objectVersion property contains the version of domain preparation. The version for Exchange Server 2013 is 13236. • Creates a domain global group called Exchange Install Domain Servers in the current domain. • After all of these commands are successfully completed, your AD DS is ready for Exchange Server 2013 installation. You can check if preparation went well, by performing the following tasks: In the Schema naming context, verify that the rangeUpper property on ms-Exch-Schema-Version-Pt is set to 15132.
organization>,CN=Microsoft Exchange,CN=Services,CN=Configuration,DC=<domain> container is set to 15448. • In the Default naming context, verify that the objectVersion property in the Microsoft Exchange System Objects container under DC=<root domain is set to 13236. All other roles, except the Edge Transport role (which does not exist in Exchange Server 2013), are integrated within these two roles. 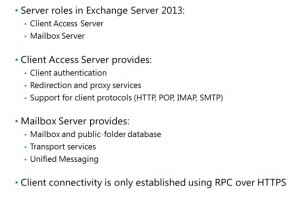 Unlike Microsoft Exchange Server 2010, in which the Mailbox Server role hosted only mailbox and public folder databases and provided email storage, in Exchange Server 2013, the Mailbox Server role also includes Client Access protocols, Hub Transport service, mailbox databases, and Unified Messaging components. 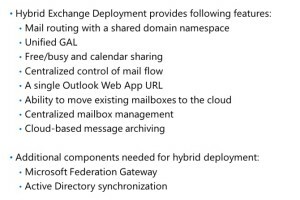 This means that the functionality of three roles in Exchange Server 2010 (Mailbox, Hub Transport, and Unified Messaging) is now integrated in only one role in Exchange Server 2013. 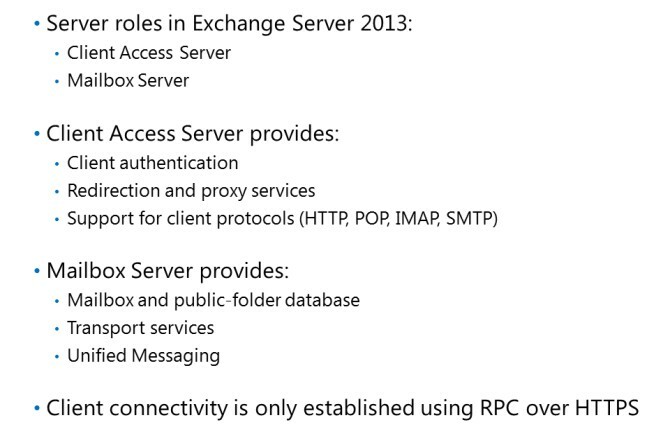 The Client Access Server role has changed in Exchange Server 2013. The Client Access server is now basically a proxy server that handles all client connections, by admitting all client requests and routing them to the correct active Mailbox database. It provides authentication, redirection, and proxy services, and offers support for the following client access protocols: HTTP, POP and IMAP, and SMTP. Also unchanged is the fact that the Client Access server does not store any user data on itself; nor does it do any message queuing. The Client Access server role also provides some security functionality, by enforcing SSL in communication with clients. In some scenarios where the Exchange Server is deployed in multiple sites within one organization, the Client Access server also can redirect the request to a more suitable Client Access server or proxies the connection to the right Mailbox server. use the Exchange Server 2010 Edge Transport server with Exchange Server 2013 servers. • Stateless server. In Exchange Server 2007 and 2010, most of the protocols on the Client Access server required session affinity in scenarios where the Client Access server was in a load-balancing cluster. That meant that all requests from a single Outlook Web App client had to be handled during an entire session by a specific Client Access server within a load-balanced array of Client Access servers. In Exchange Server 2013, this is no longer the case, and the Client Access server is now stateless. All processing for the mailbox now happens on the Mailbox server, so it does not matter which Client Access server in an array of Client Access servers receives each individual client request. By implementing this, you can use Layer 4 load balancing instead of the more expensive Layer 7 load balancing. This allows hardware load balancing devices to support significantly more concurrent connections. client authentication for client connections and sends AuthN data to the Mailbox server role. The connection between the Client Access Server and Mailbox server is established by using a privileged account that is a member of the Exchange Servers group. This allows the Client Access servers to effectively pool connections to the Mailbox servers. With this technology, a Client Access array can handle millions of client connections from the Internet or internal network, but uses many fewer connections to proxy the requests to the Mailbox servers than in previous versions of Exchange. In Exchange Server 2013, the Mailbox Server role provides much more functionality than in previous Exchange Server versions. This includes integration of the Hub Transport service (previously known as the Hub Transport server role) and Unified Messaging service (previously known as the Unified Messaging server role). This is the key role for storing mailbox and public folders data, as well as for Unified Messaging functionality and message queuing. The Mailbox Server role also interacts with the Client Access server, as well as with AD DS domain controllers and global catalogs. 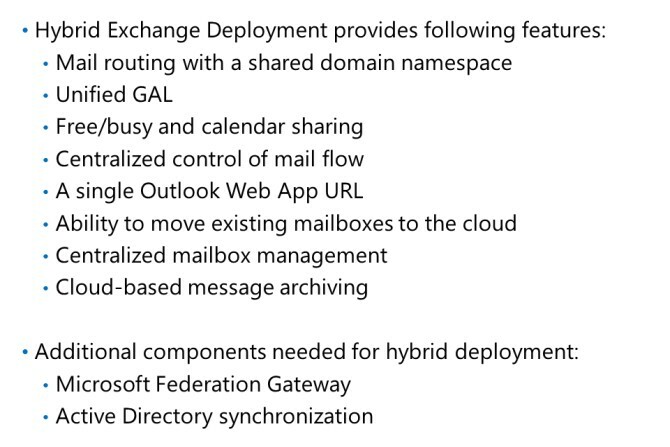 The Mailbox Server role never communicates with clients directly, as it did in previous versions of Exchange Server. All client-based communication is performed through the Client Access server role. Because of the modifications that were made to the Exchange Server 2013 architecture, changes were also made to the way in which clients communicate with the Exchange Server, and how Exchange Server 2013 roles communicate with each other and with AD DS components. 2013, all client connections are established by using RPC over HTTPS. This means that all clients are connecting by using the Outlook Anywhere service. This eliminates the need to have the RPC service running on the Client Access server. In addition, you will have one fewer FQDN to manage, because all clients will be using a new connection point made up of the user’s mailbox GUID + @ + UPN suffix. As a result of these changes, only Outlook 2007 and newer clients support connection to Exchange Server 2013.
organize server roles, and you must choose the appropriate Exchange Server 2013 version. • Exchange Server Standard CAL. This license provides access to email, shared calendaring, Outlook Web App, and ActiveSync. • Single server deployment. In this scenario, you deploy both Exchange Server roles on a single server. This scenario is appropriate for small organizations with limited resources. Deploying all Exchange Server services on a single server has several drawbacks. These include having a single point of failure for your whole messaging system, and not having any high-availability options. If you choose to have a single-server Exchange deployment, it is recommended that you deploy Exchange Server inside a virtual machine, and that you keep that virtual machine highly available or at least replicated to another Hyper-V® in Windows Server 2012 host. This will provide you with high availability and redundancy for critical Exchange services. • Multiple server deployment. In the multiple-server deployment scenario, you usually install the Client Access Server role and the Mailbox server role on separate servers, or you install more than one server with both roles installed. This requires that you provide at least two virtual or physical machines for the Exchange Server deployment. In scenarios where you also want to provide high availability, you should add more machines to build the Client Access load balancing cluster and DAGs. You cannot use DAGs and network load balancing (NLB) on the same set of machines. To achieve full redundancy for Exchange Server, you need at least four servers for Exchange, and at least two domain controllers. • Hybrid deployment. A hybrid deployment provides the ability to extend on-premises Exchange Server functionality to the cloud. In this scenario, you connect your AD DS and Exchange Server with Microsoft Office 365. This allows you to move some of your Exchange resources to Office 365. A hybrid deployment also can serve as an intermediate step prior to moving completely to an Exchange Online organization. Office 365 is a suite of four Microsoft services that are now available in an online version: Exchange Online, Lync® Online, SharePoint® Online, and Office Professional Plus. It is a subscription-based service that features various pricing options. • Mail routing with a shared domain namespace. For example, both on-premises and cloud-based organizations use the @adatum.com SMTP domain. • A unified global address list, also called a shared address book. With this address list, users can view all contacts from both on-premises Exchange and Office 365. • Free/busy and calendar sharing between on-premises and cloud-based organizations. • Centralized control of mail flow. The on-premises organization can control mail flow for the onpremises and cloud-based organizations. • A single Outlook Web App URL for both the on-premises and cloud-based organizations. • The ability to move existing on-premises mailboxes to the cloud-based organization. • Centralized mailbox management using the on-premises Exchange Management Console. • Cloud-based message archiving for on-premises Exchange mailboxes. Exchange Online Archiving can be used with a hybrid deployment. • Microsoft Federation Gateway. The Microsoft Federation Gateway is a free service that provides a trust connection between your Exchange Server (installed on premises) and Exchange Online (as a part of Office 365). It is mandatory that your on-premises Exchange organization trusts Microsoft Federation Gateway. You can configure this trust relationship manually, or it can be created automatically as part of configuring a hybrid deployment with the Hybrid Configuration Wizard. A federation trust with the Microsoft Federation Gateway for your Office 365 tenant is automatically configured when you activate your Office 365 service account. • Active Directory synchronization. If you want to provide services from Exchange Online to your local users, you must synchronize information from your AD DS to Exchange Online. Active Directory synchronization replicates on-premises AD DS information for mail-enabled objects to the Office 365 organization, to support the unified GAL. Organizations that configure a hybrid deployment must deploy Active Directory synchronization on a separate on-premises server. Server 2013. Once the migration is complete, you can decommission your old Exchange Server.